I’ll add some pics later, but I’ve got the tank and seat off the bike and I’ll say that the “gently used” comment in the last post is a misnomer. It’s got some notable (surface) rust on the frame and the generator cover was bunged-up and leaky. A new one is on the way. I stopped by my local shop today, only to find that they don’t work on bikes this old, so I’ll be on my own for most of the work as needed. And eBay seems to be the best place to find parts! 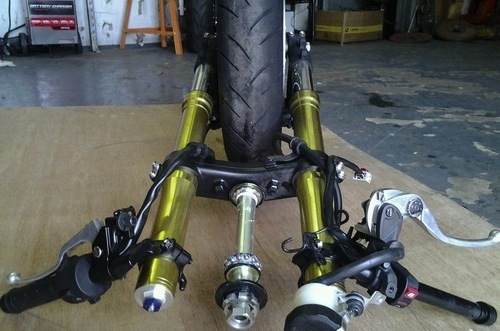 Speaking of eBay, I found a whole 2012 CBR600RR front end – forks, triples, clipons, switch gear, brakes, rotors, wheel, tire – the whole shebang for $800 (img, img). Needless to say, it’s mine now. Once it arrives, it will be off to Classified for their magic. 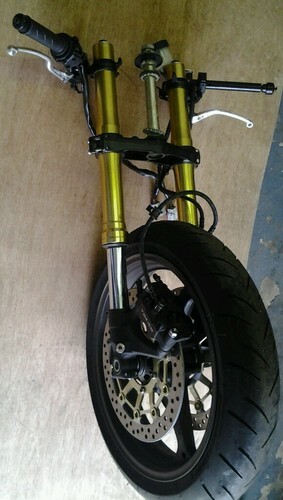 I will be totally stripping the frame and having it powder coated. The original tank will be repaired and it and the planned seat cowl will be painted. I’m thinking frame in yellow and tank/seat cowl in British Racing Green. Or orange. We’ll see.